Net is a high performance component enabling developer to convert excel files (xls, xlsx,csv) to html files. The component can be implemented in c#, vb. Net or asp. Net projects/websites. The component is completely independent and does not depend on third-party libraries and microsoft office automation. 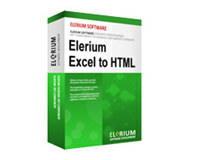 Elerium Excel to HTML .NET is an utility that works under windows xp, windows vista, . It supports both 32-bit & 64-bit windows editions, therefore it could run faster on 64-bit computers. Estimated download time for Elerium Excel to HTML .NET on a common adsl connection is less than a minute. Version 1.7 was released two thousand twenty six days ago by Elerium Software. Click the green download button to download it now.